The latest data from Zurich-based Swiss National Bank (SNB) comes months after a new framework has been put in place for automatic exchange of information between Switzerland and India to help check the black money menace. While overall, total foreign deposits rose by only 3 per cent, China also saw a significant jump in the money parked by its residents — up 69 per cent, from CHF 9.45 billion in 2016 to CHF 15.95 billion. After declining for three successive years, money parked by Indians in Swiss Banks rose 50 per cent to CHF (Swiss Franc) 1.02 billion (Rs 7,000 crore) in 2017 over the previous year. The latest data from Zurich-based Swiss National Bank (SNB) comes months after a new framework has been put in place for automatic exchange of information between Switzerland and India to help check the black money menace. While Switzerland has begun sharing foreign client details on evidence of wrongdoing provided by India and some other countries, it has agreed to further expand its cooperation on India’s fight against black money with a new pact for automatic information exchange. Bankers attributed the jump in Indian deposits to a variety of factors: the 39 per cent increase in foreign remittances (total of Rs 77,939 crore in 2017-18) under the RBI’s Liberalised Remittance Scheme (under which a resident Indian can remit $250,000 per year); increase in reporting after a three-year crackdown on disclosure of black money parked abroad. At Rs 7000 crore, this is a fraction of the Rs 44,500 crore that was parked in Swiss banks by Indians in 2006. 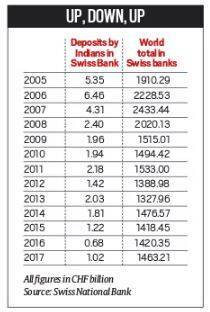 The increase in 2017 comes after money parked by Indians in Swiss banks dropped sharply from CHF 2.03 billion (Rs 14,000 crore) in 2013 to CHF 676 million (Rs 4,660 crore) in 2016. In fact, this dip coincided with the crackdown and came despite the fact that LRS limits were eased, from $75,000 in August 2013 to $250,000 in May 2015. Data shows that Indian money in Swiss banks included Rs 3,200 crore in the form of customer deposits, Rs 1,050 crore through other banks and Rs 2,640 crore as other liabilities such as securities at the end of 2017. Another Rs 112 crore was held through fiduciaries or wealth managers. For Pakistan, it declined from CHF 1.38 billion to CHF 1.1 billion in the same period. The deposits of US residents in Swiss Banks stood at CHF 165 billion and declined from CHF 175 billion in 2016. Over the last three years the Indian government took several measures to crack down on black money. After the Enactment of Black Money (Undisclosed Foreign Income and Assets) and Imposition of Tax Act, 2015 under which it provided a one-time compliance window to taxpayers to make declarations of their undisclosed foreign assets, the government provided compliance window for declaration of undisclosed income through the Income Declaration Scheme (IDS) in 2016. This was followed by Pradhan Mantri Garib Kalyan Yojana (PMGKY) in post-demonetisation phase. While assets worth Rs 4,100 crore were declared by over 640 persons under the black money Act, under IDS, disclosures worth Rs 67,300 crore were made by over 71,000 persons. Under PMGKY, disclosures of about Rs 4,900 crore were made by about 21,000 persons. In addition, a joint declaration for the implementation of automatic exchange of information (AEOI) was signed between Switzerland and India in November last year which provides that both countries would start collecting data in accordance with the global standards in 2018 and exchange it from 2019 onwards. With the completion of the parliamentary procedure in Switzerland and signing of mutual agreement, India and Switzerland are set for automatic exchange of information for the period beginning from January 1, 2018, the CBDT had said in December last year. Even the Swiss Parliament had in 2014 tightened the country’s money-laundering rules stating that there would be a cap of CHF 100,000 ($104,000) on cash transactions. It also said that all individuals including foreign politicians and high-profile officials will be watched more closely.